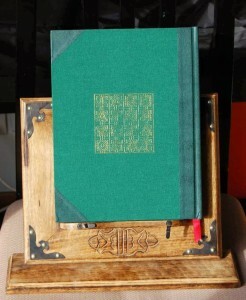 For years, I have wanted to create a magical book; something that you can use as a magical tool. The idea has been around since the middle ages. 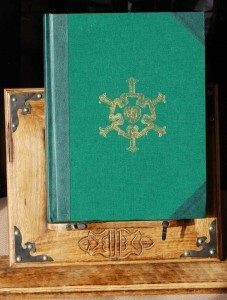 The Ars Notoria would provide you with a diagram, or a magical seal on the left hand side which you would meditate on while saying a prayer on the left hand side. 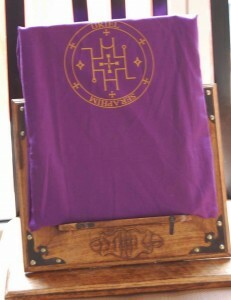 Now a Canadian occultist Fra Alim has managed to create a Golden Dawn version of what I always wanted. It has taken him ten years hard work and meditation and getting a copy is a real honour. It arrives in a purple bag with its own seal of protection. Inside, Alim has taken several different aspects of the Golden Dawn tradition and built specific diagrams which unlock those particular ideas. On the right hand side are the parts of the ritual, or prayers which unlock the seal and are used as part of the diagram meditation. To a muggle these are simply beautiful diagrams, but to a magician the seals manage to take you places both intellectually and astrally. In combination with the prayers or meditations you are taken to places which depict different aspects of reality as seen through the lens of Tiphareth. This is only possible if the artist, in this case Fra Alim, has an experience of those particular states. If someone who had not experienced these states had created such a book, the doors would lead to lower astral or simply intellectual ideas. These seals take you to spiritual visions. Particularly useful are his seals for the Spheres on the Tree of life. These would be very effective if used ritually by placing the book in the east and opening it on an appropriate page to bring in the sepherotic power for the ritual or to prepare the magician before they start a ritual. It would be useful for a Heirophant to meditate on the Malkuth seal and meditations before attempting to initiate someone into the 1=10. The book itself appears to have a life of its own. Paola became very attached to it and it seems to like her a lot. It lets you discover something new about the Golden Dawn when you open a page at random. It is a strange and beautiful experience. I have favourite pages one includes a much better version of the Qesheth for the portal grade than the GD or the SM came up with. Fra Alim’s work is still personal to him, so he is understandably reluctant to give it out, and certainly not to anyone below a certain grade within the tradition. However, if you are real spiritual seeker within the Golden Dawn and under the rose you can seek him out on Facebook for a chat. If you are lucky, he might let you buy one of these. 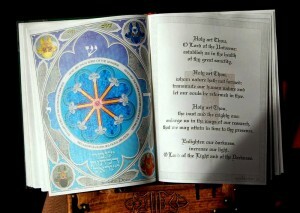 Magical Machine — The Golden Dawn Vault in Colour limited edition book out now. Beautiful. I’ve been doing something similar with the Mansions of the Moon, myself… but I doubt they’ll ever see print. You have a beautiful and spirited creature, there, Nick.